If you were about to start a company dedicated to providing software application development engineers with mapping and location-based APIs and SDKs, then what would you call it? MapTech perhaps, or Locationsoft… perhaps even GeoMapLocaNavTech? Here Technologies went for the arguably more honest and Ronseal does what it says approach and called itself Here. Actually it didn’t, the company cheekily tried (like so many others) to spell its non-acronym name all in capital letters and you might think, in branding terms, that that’s a quite clever way of getting your corporate label listed more prominently in the press showing in full CAPS. But it isn’t. 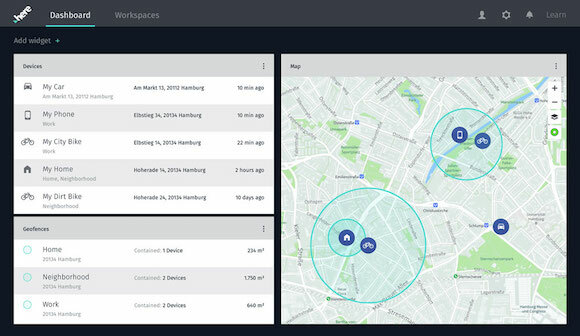 Here works in mapping and location platform services and has now introduced a freemium option for developers to build applications using the company’s location software, which is said the be ‘enterprise-grade’ in form and function. What Here gives developers is access to geo-location-related data and platform services including: maps, geocoding, geofencing, places and intermodal routing, as well as features such as turn-by-turn navigation and custom route, waypoint and fleet APIs with the simple pricing plan described below. Geocoding is the computational process of transforming a physical address description to a location on the Earth’s surface as spatial representation in numerical coordinates. Reverse geocoding, on the other hand, converts geographic coordinates to a description of a location, usually the name of a place or an addressable location. Geofencing is the use of GPS or RFID technology to create a virtual geographic boundary, enabling software to trigger a response when a mobile device enters or leaves a particular area. Intermodal routing is a service that allows developers to provide routes combining three different routing modes for car, pedestrian and public transit; as well as access to parking information within the proximity of transit stops. “Location-awareness is the foundation for our digitally connected world,” claims the fabulously named Edzard Overbeek in his role of CEO of Here Technologies. Overbeek details the freemium plans saying that it provides free access to Here software to create public, private, paid and free applications and websites with a limit of 250,000 platform transactions, 5,000 SDK active users and 250 managed assets per month. There are extended pay-as-you-grow options that go beyond its freemium offering linked here.